Poodle Blogger: Meet Joey, the Journal writing Poodle pup! I want to introduce you to Joey, the newest addition to the Dunlap household. 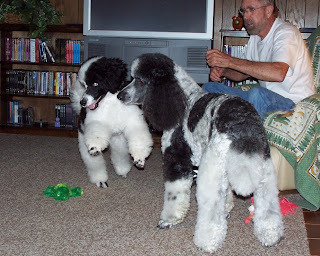 Charlene and Glenn Dunlap are very talented photographers so it is always fun to go to their website and see photos of their dogs, as well as reading about their training for Poodle movies. Their other two Standards, Jyah and Sydney, are trained to do all types of amazing behaviors which are featured in Poodle movies.I am sure that Joey will soon also be a movie star! If you have never seen one of these Poodle movies, you are missing a treat. They are different from other movies featuring dogs, because the characters the dogs play are so believable. This is because when you see the dogs doing something, whether it is setting the table, or walking a tightrope, they truly are doing these things, it is not a camera trick! You can see video clips, or even view a short movie for free on Charlene's website, Canine Horizons. Recently I learned of "Joey's journal" where this talented young pup(smile) keeps his friends updated of his daily adventures. Charlene has generously agreed to allow me to share some of Joey's adventures with you, so stay tuned!